The weather on the East Coast may have been its usual February frigid, but across the country in Los Angeles the unseasonably warm temperatures and sunny days were the perfect backdrop for a working vacation during Grammy Week. Once our plane touched down, we stripped down and out of our coats and boots to rock short sleeves and sandals. After a quick wardrobe change in the ladies room and scooping up our luggage, we were ready to roll and our first stop was to pick up our whip for the week courtesy of DriveShop. 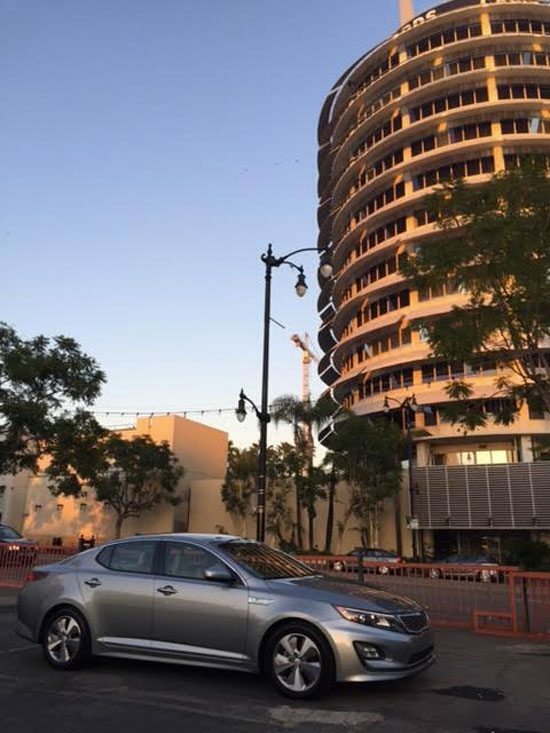 We couldn’t have had a more stylish ride than the sleek 2016 Kia Optima Hybrid EX. The vehicle's high-end features made for a luxurious trip around Los Angeles. We picked up the vehicle, pumped up the old school jams on The Groove on SiriusXM and the L.A. turn up commenced. We engaged the onboard navigation system and headed to our hotel to check in then off we went to In-N-Out for a double double animal style and fries. Jet lag and a food coma soon caught up with us, but it was all good because we needed our beauty rest for the rest of the weekend. That Saturday, I was the hostess for the 8th Annual MojaMoja Brunch & Benefit Concert and the ride to the Avalon Hollywood was a smooth one in our silver-colored chariot. We cranked up the Infinity Premium Audio System and jammed to a Spotify playlist featuring this year's MojaMoja performers Goapele, Lizzo, Gavin Turek, Mara Hruby and Raquel Rodriquez. Like those showstoppers, no matter where we went we turned heads in the 2016 Kia Optima Hybrid EX. Whether we were hanging out near the iconic Capitol Records Building in Hollywood, driving on Sunset Boulevard in search of Thai or navigating our way to The Grove for a mandatory trip to See’s Candies for California Brittle and Rum Nougat, this car was a dream to drive. Anyone who has driven in Los Angeles knows that the traffic on the 405, 110, 101 and what have you often requires the skill and precision of a NASCAR driver. Thanks to the safety features in the Optima, we felt like pros. The reverse camera and side mirror alerts helped make navigating L.A. traffic safe and uneventful. The fuel economy for this vehicle was amazing -- after ripping and running for five days and driving almost 200 miles, still having almost a full tank of gas at the end of our trip was pretty awesome. For our last night in town, we couldn’t resist the draw of the L.A. Waterfront in San Pedro. 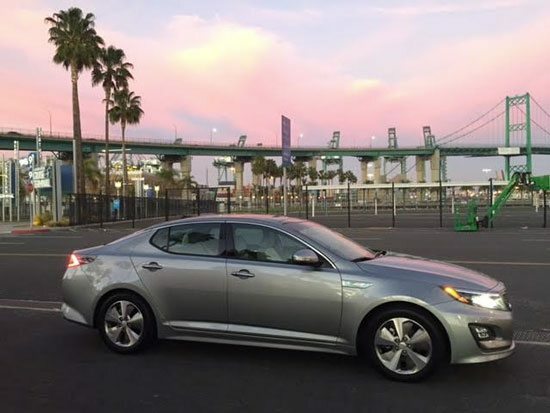 The sunset lit up the sky with pastel shades of yellow, pink, blue and purple and provided a beautiful scene for some quick photos of the 2016 Kia Optima Hybrid EX in all her glory. The next day we wrapped up our stay, bundled up for our trip back East and returned the Optima after an excellent experience with a new outlook and respect for the Kia brand.